More than anything else parents of babies want to do the things that make their little ones happy. Sometimes, despite their best efforts, babies fuss. As difficult as it can be to feel helpless to calm a crabby baby, it is important to understand that babies, like all people, experience and display a range of emotions, not always pleasant. By learning about the needs of not only their own baby, but babies in general, parents can come to understand their baby's emotions, making them better able to keep their wee ones happy. Seasoned parents will tell you that they can sense what their baby needs, merely from listening to the sounds that it makes. It can take a bit of time, however, for parents to learn to interpret these sounds, and the learning process can be exasperating. Priscilla Dunstan, a mother herself, observed that her infant son made different sounds at different times, depending on what he needed. She found that he consistently used five assorted sounds, each with its own meaning. Intrigued, she noted that other babies used the exact same five sounds. While many parents find that they independently learn to recognise their baby's needs through sounds and facial expressions, others have been delighted to purchase the Dunstan's Baby Language DVD's, taking a shortcut to understanding their baby's emotions. While babies, like the rest of us, vary in their expression of emotion, there are some universal similarities in their emotional development. Of course, as babies mature, their capacity to experience complex emotions increases, making them both more interesting and fun to be around! In the very beginning, babies are typically quiet when they are content and cry when they are hungry, wet, soiled, hot, cold, or lonely. A month or two later, however, they usually reward their parents with their very first smile brought on by happiness at recognising a familiar face. As time progresses, giggling and excited movements when they are pleased indicate that babies are very capable of expressing their emotions. By about three months, babies will "talk," cooing, gurgling, and sometimes even imitating simple sounds that their caretakers make. Not all of their displays are happy ones, though. Angry or frustrated babies will make their emotions known, too! Stranger anxiety and separation anxiety both appear during the second half of a baby's first year. 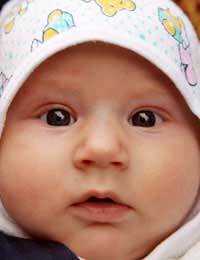 Babies will cry, often intensely, when they are feeling fearful. Fortunately, this time frame is also marked by a baby's increasing enjoyment of social interaction with familiar loved ones, and often, first words and delighted squeals accompany their joyful expressions. As babies become toddlers, they tend to show a side of themselves that mum and dad may not enjoy quite as much as their bubbly-baby side. Frustration and anger are commonplace as toddlers learn to assert their desires. Parents can take comfort in knowing that not only are displays of temper perfectly natural at this age, but the tendency to lash out will subside a bit as toddlers expand both their physical and verbal skills. At about 18 months, parents will notice that their babies are beginning to express emotions that relate to the feelings that others are experiencing. For example, when a sibling cries or seems sad, an 18 month old may show signs of empathy. This is heartening for parents to witness, as it is a certain sign that their baby's emotional quotient is increasing.